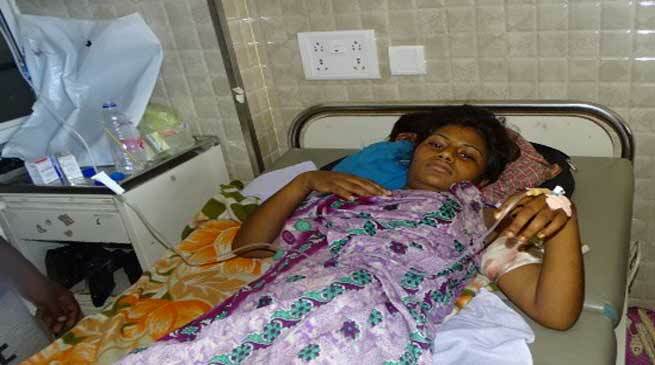 In a bizarre incident of gun shot out case at Lekhi in afternoon of August 21 wherein a young girls of 15 years critically injured and lying in bed in terrible condition. SP, Capital Dr. A Koan informed that case of gun shot out reported from Lekhi area yesterday when in one girl Anura Begum d/o Abdul Hussain received bullet injuries and is admitted at TRIHMS, Naharlagun. It is a incident of around 3 to 3.30 Pm when Anura went to her elderly friend Sharifa Khatun for mobile charging and she received bullet when she was near the door while heard a sound of gun shot and find that she have been critically injured. The parents and few other later taken her to the hospital where she is under treatment. A case have been registered at Nirjuli Police Station wide Case No-31/17 u/s-307 IPC RW Sec 27 Arms Act and investigation have been launched, the area have been visited by team of senior police officer including himself and said that so far no one have been arrested. When asked what may be reason SP said that it is too early to say, but information gathered from source said that the firing may be done by hunter and may be a case of hunting, hunting were reported by the locals in those area earlier. The bullet have hit her left arm before getting lodged near the spinal cord and expected she would be operated tomorrow then he can say by which bullet she was injured. The father of the victim Abdul Husssain is working in agriculture field of Kipa Tung and her daughter was there for last 2 month and staying with him. However of late Naharlagun SDPO Make Buil informed that the case have been detected and one person have been arrested in connection of the shot out case, the person have been identified as Taba Serbang, 28 years, businessmen and a .32 pistol/revolver alongwith 11 live round of cartridge have been seized from his possession and today he may be produced to cout. Bui further said that ht victim may be operated here at TRIMHS at Naharlagun or she may be evacuated to NEGRIMS, Shillong.